Last week I heard some sad news from my extended family. My cousin had gone out to Zimbabwe for her aunt’s funeral. While she was there, she was on a boating trip. She stood up at the wrong moment, fell over the side and hit her head on the propeller. She never recovered from the extensive brain damage, and a few days later her heart gave out. She was in her late twenties, recently married. I was really shocked by the news. I had lost touch with her, and had only really known her as a child rather than as an adult. My memories of her are mainly of her giggling shyly with us at family get-togethers. She had a great sense of fun. As an adult, she cared deeply about her family, with whom she was very close, and she was a loyal and compassionate friend to many. I felt saddened, mainly on behalf of my extended family rather than for myself. But most of all I felt shocked. We don’t expect these things to happen – not to people we know, not to us. I secretly believe I am immortal. Well, not immortal exactly, but in control of how and when I will die. That may sound strange, as someone who is more aware than the average person of their frailty and weakness. I was explaining to a friend, ‘I think I’m going to die, but of M.E. or of cancer or heart disease which comes as a result of M.E. – and in the future. I expect to have warning of it.’ In other words, I would quite like to be in control of my death, at least a little bit. Death should only come to those who are old and full of days, and softly, as a release from pain of illness. I don’t expect to die in an accident. That wouldn’t be ‘fair’, when I already have something that could one day potentially kill me. Neither does it seem right or fair that my cousin should die in her twenties, whilst on holiday, and just undergoing bereavement herself. I feel like somehow we should be immune from death under these circumstances – we should have a temporary reprieve. But death does not submit to our negotiations. In one sense it is good for me to feel like this, to be so resistant to death. Death is wrong. Evolution, science, Buddhism would tell us that death is a natural process and not to be feared. The Bible calls it our last enemy. The reason that it feels so ‘unnatural’ is because it IS unnatural. We have eternity written in our hearts. Death came in through sin, it is not the way it was supposed to be. On the other hand, it’s not good for me to feel invincible because it just isn’t true. Death is out of our control. I don’t like this fact. I like to think I can guard the safety of my loved ones, that I can plan long-term. I like to think I am in control of my life, that I am made of strong, indestructible stuff; shiny, hard metal, or enduring wood. I am not. I am dust. The truth is that our bodies are fragile, and our lives are fleeting. Every so often, it is good for me to remember that I am dust. I am not in control of my life, and I am not in control of my death. Only God knows how long I will be here for. God is the author of my story within the Big Story and only He knows my ending. I need to entrust my life – and my death – into the hands of the one who numbers the hairs on my head and measures out my days on this earth. I need to trust the one who takes the dust and breathes life into it, who creates and redeems and recreates. I need to trust the one who knows that I am dust. (I know this is a bit morbid but…) How helpful do you think it is to be aware of our own mortality? To what extent are you aware of yours? Very well written post. I too often find myself in that mode of thinking that death will come with a warning at least. I’ll have time to prepare myself and family for it. The truth is that is simply not a guarantee. It is exciting to think about our eternal bodies that we will have when Christ returns! I like to imagine what it will be like! Thank you for your affirmation, Mary Beth! I find it really hard to think of our eternal bodies, and heaven at all, in fact – but it is good for me to be reminded that it is exciting, even though it is so unknown. Thank you! I used to be very afraid of death, as an unknown process I had no control over. I had a congenital heart condition as a teen, and required resuscitation too many times to count, so I had a living will at age 15 and was painfully aware that I may not live to see my 20s. In my 20s, I had an unexplained cardiac arrest that scared the living daylights out of me, and my reaction to that was to live harder and faster than I imagined possible – I slept only 3-4 hours a night, worked double shifts at the pediatric hospital trying to do as much good as I could, and on days off I crammed life full with whitewater kayaking, snowboarding, hiking, mountain biking, eating crazy ethnic food…anything and everything that made me feel like I was sucking the marrow out of life. Again in my early 30s, I had a significant heart event that I thought would end my life. Tears sprang to my eyes in those last minutes because I was SO NOT READY to leave my husband and children. However, just a few weeks ago, I had another health event, and finally something has really changed inside me. I am totally willing to go on, if that is what God wills for me. But I am so physically exhausted by cancer and the effects of this life-long heart condition that I have begun to long for my “eternal rest”. Death feels almost like it will be a relief of sorts. Now I am praying that God will give me just the right amount of time (whether that be a year, 10 years, or 50 years!) to shape and love my children to the extent He would have me do so. Oh wow, Genevieve. I’m so stunned by how much you have had to carry around with you for so long. It is HUGE to have to be dealing with a life-threatening condition at such a young age. What you describe just sounds terrifying to me, and a lonely thing to have to carry. As ever, I am deeply challenged by your character and testimony. Thank you so much for sharing – this is stretching my thinking and my trusting. I’m afraid to die. I have a very old neighbor who is very slowly losing his strength and energy, and he is so ready to die. I think if it happens that way, I will feel the same way. But I want to die by accident, fast and unexpected. Even though I know that’s incredibly difficult for those left behind. It does help me to think about the brevity of life though. It helps me to make people more important than things or myself. I need that. Thank you so much for stopping by! – and for your honesty here. I think you’re probably one step ahead of me in being afraid to die – I’m just in denial that it’s going to happen. And you’re so right that it should lead us to value people, not things. It’s good for me to be reminded of that, too. You have a way of writing out thoughts that I have had, but I’ve never given words to. I somehow think that I have suffered enough in this life, that perhaps I won’t have to suffer in death. In fact, just a few days ago, I prayed a prayer asking God to allow me to die peacefully and without suffering when my times comes. (Hopefully, at a ripe old age!) That even sounds strange to type that out. I guess I never would’ve have shared that thought with anyone. You are wonderfully vulnerable and that is a blessing to me. Thank you for your writings and for your heart. You have reminded me that we are not in control and that God’s plan is better than ours. ” I need to trust the one who knows that I am dust.” Yes, I do! Thank you so much for your kind words, Ann! I can totally understand the wish to die peacefully, and the sense of needing to ask God for that. It’s funny, our generation is one that never talks of death, so sharing these things feels like a really big secret. I guess in other generations it was much more talked about. Thank you for encouraging me to be vulnerable – it is so great to know that I am not alone in thinking these things! I’m so glad to have connected with you! My dearly loved and respected, Godly and wise father died Aug. 5. As his soul slipped the “surly bonds of earth to touch the face of God” we sang hymns and especially his favorite “In the Garden.” He died very early on a Sunday AM. “In the Garden” is about Mary Magdeline’s encounter with the risen Christ early on the first Easter Sunday AM. What exquisite and comforting Providence! Thanks for your thoughts! Thanks so much for stopping by. Wow – I guess you must be in a whirlwind of emotions at the moment as you mourn your father. How amazing that you were able to be with him and sing songs in the sure hope that he will now be singing with the angels in heaven. Thinking of you. I am sorry to hear of the double loss in your family with your aunt and cousin’s death. My heart goes out to you guys. 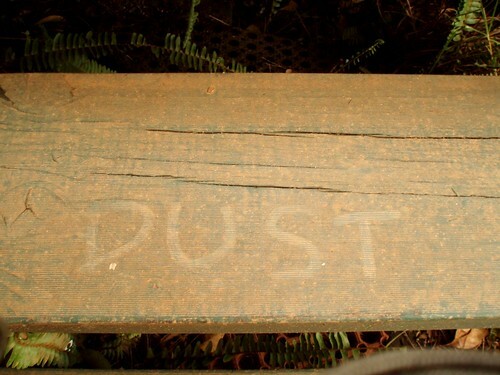 I love the name of your post ‘ Dust’. With the Fm/Me, I sometimes wish that God did not put such a highly developed nervous-system in the dust He used to create man! Oh well, I think the worst death is to go through the second death without our Lord. Praise God that we, as His children, will never have to experience that. Hi Mia – thanks so much for stopping by and your kind words. I think you are wise to identify that the ‘second death’ is worse than death itself. It is hard to keep our perspective on these things, I find… Blessings to you today. Good post tanya. I think we only really think of death when others die, and we only realise that it isn’t as it is supposed to be when someone young dies. We subconsciously expect to live three score years and ten (or more than that), and when we don’t, we feel they have been robbed of something. As if life, or God, owes us. He doesn’t. We are dust, and he gives (as a gift) and takes away. It’s how we react in that which matters (cf. Job). Of course, it’s also worth remembering the lengths God has gone to to correct that ‘wrongness’ which is death. For the record: I’d like to go suddenly in my eighties whilst enjoying a brisk walk on a sunny day. But we don’t get to pick, do we! Thanks so much for commenting. I can totally relate to the ‘feeling entitled’ to my 3 score years and ten. I shall ponder on that thought – life as entitlement vs life as gift. And yes, it’s definitely worth remembering what God has done to correct that wrongness, that death doesn’t have the final word. Thanks so much for sharing, Katie. Interestingly, when I was a child I had a much clearer desire to be with God in heaven, and an excitement about meeting God. As i’ve got older, that’s waned a bit. I’m pretty sure that it’s not supposed to be in that general direction, but oh well… Perhaps it’s the season of life? Certainly for me it has been marriage and having a baby that has influenced this reluctance to go to heaven, which I guess is natural. It’s hard to get the right perspective, isn’t it?